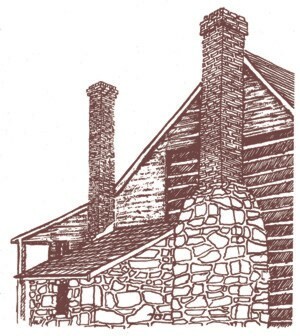 When John Poole, Jr. became the first storekeeper in Poolesville in 1793, widely scattered farms were separated by miles of virgin forest. The economy was localized; all of the farms were almost totally self-sufficient, and there were few settlements of any consequence. Poole built his small one-room-and-kitchen log house facing Coxen’s Road but it is doubtful that he envisioned the establishment of a town there. Instead, he seemed content to operate his small store from his residence, offering his services as merchant to travelers and farmers from this roadside location. It was John Poole’s uncle, Joseph, who first recognized a potential for development and accordingly marked off six lots from his property, east of his nephew’s house. These lots were for the use of Joseph’s children, but only two of them were ever built on. In 1807 two of Joseph Poole’s sons acquired a lot on the west side of John Poole’s house and established a store. Shortly afterward an adjacent lot was acquired by a merchant who built a third store. The continuing agricultural development of the areas around Poolesville and the increased use for the road encouraged other property owners to subdivide their land into town lots, following the example set by the Poole family. In 1819 Robert Peter began selling off lots from his property, Peter’s Forest, which faced Coxen’s road and the Poole properties from the south side. His son, George, continued this practice, but was forced to petition for a change in the alignment of Coxen’s Road to make his lots more accessible. Peter was successful in his bid for the road development of the Poole property east of the old John Poole house. The change in the road also caused a shift in the building pattern from along the old Coxen’s Road to the south side of the new road. 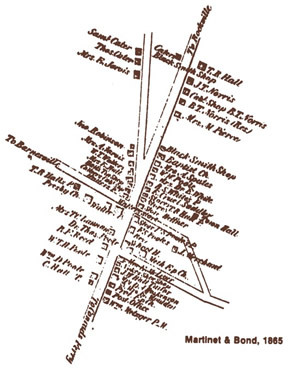 Essential to Poolesville’s development during the 1820-40 period was its proximity to various Potomac ferries and the Chesapeake and Ohio Canal which opened on December 1, 1833. The opportunities for trade created vitality within the young community as farmers passed through the town to and from the canal. An increased demand for lots undoubtedly encouraged Alexander Whitaker, owner of a tract of land on the west side of the Poole and Peter properties, to direct in his 1828 will the laying out of sixteen lots. These lots followed both side of Coxen’s Road west of Beallsville Road, and caused a shift in the building of the town from the east to the west side, this defining its historic center. During this period, Poolesville’s role as an agricultural service center became assured. As a trade center, Poolesville was the focal point for farmers who came to market their produce and purchase supplies and equipment. Town residents supplied services as well as goods, since the majority of inhabitants were engaged in skilled trades. Blacksmiths, wheelwrights, shoemakers, tailors, carpenters, barbers, coopers, and cabinetmakers were found here, representing trades necessary to the life of a mid-nineteenth century farming village. Lawyers and doctors opened practices. Livery stables, general stores, several taverns, and a hotel were among other conveniences the town offered. A surge of agricultural prosperity in the 1850’s was produced by the discovery and widespread use of improved agricultural techniques. New fertilizers like Peruvian guano, the introduction of different crops such as cereals and grasses, and experimentation with crop rotation brought about extensive changes in the system of farming. The prosperity this brought placed new demands on Poolesville since people could now afford more specialized services that were beyond the basic necessities. 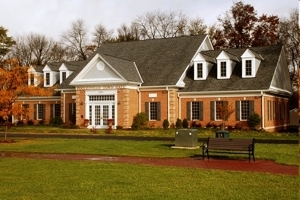 It was during this period that Poolesville reached its zenith as an economically prosperous community. By this time most of the major building had occurred and the village attained the basic appearance and character evident today. Poolesville was of major importance during the Civil War. Due to its geographic location, the Union army lost little time in stationing troops here to maintain communications with Washington. The many published dispatches headed “Poolesville” concerning Federal troop maneuvers made the town well known throughout the country. By October 15, 1861 some 20,000 Federal troops were stationed here. The Confederates, equally cognizant of the importance of Poolesville’s location, stationed approximately 8,000 troops across the river near Leesburg. On October 21, 1861, a Federal brigade, part of the Poolesville contingent, attempted to cross the Potomac near Balls Bluff and assault Leesburg. The maneuver was a disaster, resulting in the loss of most of the Union brigade and the death of their commander, Col. Edward Baker, a United States Senator and close friend of Abraham Lincoln. In September, 1862 the Confederates crossed the Potomac at White’s Ford, the first large-scale invasion of the North by Lee’s forces. On September 8, Federal troops attacked a portion of the invading forces just east of Poolesville, forcing the Confederates to retreat into the Barnesville area. Later, on October 12, the Union troops tried unsuccessfully to prevent the Confederate troops from crossing back over the Potomac River into Virginia. During the same period a local cavalry was formed under the leadership of Captain E. V. White. In December his small company captured a number of Federal troops following their attendance of church services in Poolesville. As a result of this action the Federal presence in Poolesville was increased. Throughout the winter of 1863-64 a small Union force remained in Poolesville to enforce martial law. In June, 1864 the Confederates again crossed the Potomac into Maryland near Poolesville, and raided the town on October 15, 1864. In the spring of 1865, as the war neared its conclusion, the last troops were withdrawn and the citizens of Poolesville began a valiant effort to rebuild their lives. In the post-Civil War era the role of towns like Poolesville diminished as the focus of agriculture shifted westward and the economy became less localized. The decline of local agriculture and increased industrialization brought about the collapse of agrarian-based industries. The transition from a basically self-sufficient economy to a largely commercial agriculture proved difficult for most local farmers to negotiate. During the 1870s the C&O Canal, once essential to the Poolesville economy, went into decline. The Baltimore and Ohio Railroad provided a speedier and more convenient means of transporting commercial and agricultural goods. Poolesville waned in the shadow of towns like Frederick and Rockville that could more effectively provide improved economic services. Census reports of the years 1870 and 1880 reveal that Poolesville’s growth of the antebellum periods had ceased. The town economic base became an agricultural services center for the outlying farming districts. 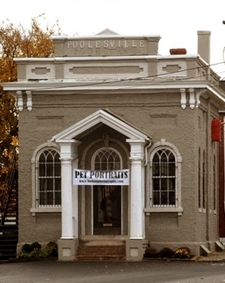 Poolesville had become an incorporated municipality in 1867, but the population and size of the town remained fairly constant until shortly after 1900 when the number of inhabitants began to decrease. 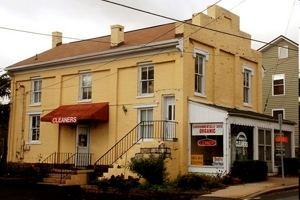 The destruction of a large part of the commercial district and various residences and shops by fire, and the introduction of new services between 1920 and the present, have since altered Poolesville’s earlier appearance. More recently favored for its proximity to larger metropolitan areas while retaining its small town qualities, new housing developments have increased Poolesville population and businesses. 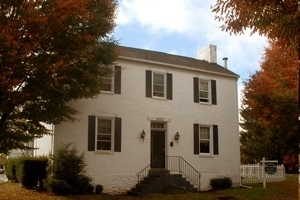 This is the oldest building in Poolesville, built in 1793 as a combination residence and store by John Poole, Jr. When first constructed it was a small log swelling consisting of a single room and attic loft with a large stone chimney at the west end. Shortly after its initial construction, a lean-to-kitchen with fireplace was added to the back. At later dates the house was further extended by frame additions. It now serves as The General Store Museum with furnishings that are based on authenticated period inventories and maintained by the Historic Medley District, Inc. The foundations of this building, the third to be built on them, are said to have been laid in 1826. The present building was constructed in 1907 and it served as a bank, going through several mergers and a closure during the Depression. In 1964 it was donated to the town and at various times was a church, a charity thrift shop and the Town Hall until it was vacated in 2003. 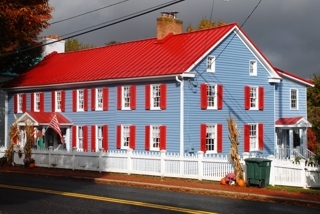 In 2006, Historic Medley District, Inc. purchased the building to establish the Poolesville Museum, open occasionally. Formerly a Baptist church built between 1864 and 1865 for members of the Rockville Baptist Church who formed a new congregation in Poolesville, this building has been adapted to commercial use. This modest appearing house, typical of early nineteenth century village architecture, was owned by W. W. Poole who operated a small store in the building to its west side. This two-story brick structure was initially built as the home of Dr. Stephen Chiswell White about 1833. 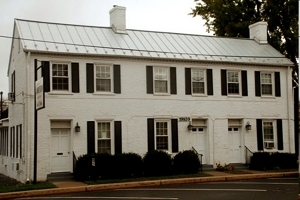 Its late-Federal style architecture is characterized by its proportions and decorative detailing, the latter including flat window lintels and the sawtooth-patterned brick cornice. The building was probably stuccoed in the late nineteenth century, about the same time that it was converted for use as a small hotel. The narrow two-story brick building on its east end dates from about the same period and might have been built as a wing. Although extensively altered and enlarged in the late nineteenth century, this attractive residence is believed to have been built shortly before 1820 as it is mentioned for the first time in the tax assessment of that year. The original two-story brick house, later stuccoed, was built by Charles Wilson and later became the residence of the son of John Poole II. It was to this house that Union Col. Edward Baker’s body was brought following the Battle of Ball’s bluff. Baker, a close friend of President Lincoln, was a U.S. Senator from Oregon and the only sitting U.S. Senator killed in action during the Civil War. The town of Baker, Oregon, carries his name. This fine example of Federal “town house architecture” was built in 1835 by Thomas Poole, a son of John Poole, Jr. There have been minimal alterations made to the original house, although a two-story east wing was later added to it. Among its most notable features are the fan lighted front door and an arched doorway in the rear wing. 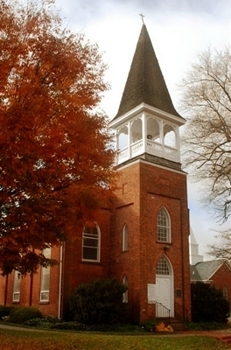 Built in 1826 by Poolesville Methodist (founded in 1816), this two-story brick structure was later converted as a YMCA (1892), the Poolesville Town Hall (1896), a veterinary clinic and a thrift shop. It is not know from what source this pleasant appearing two-part brick house derived its name and alleged date of construction. It was built on one of the sixteen Alexander Whitaker lots of 1828 and its first recorded owner was Richard Poole. Its conversion for use as a law office and apartment is an effective utilization of an historic “in-town” property. The Federal detailing of this two-story brick house indicates that it was probably built about 1825-40. It illustrates the economic prosperity and building boom Poolesville experienced during the second quarter of the nineteenth century. The Episcopal Church in Maryland dates to the first English settlements on the shores of the Chesapeake Bay in the 1630s. St. Peter's Parish was established in 1792, but its roots reach back to another century through such parent institutions as All Saints' Parish of Frederick. The first recorded meeting of the vestry was 1799. This handsome brick edifice was built by Franklin Viers in 1846 and consecrated in 1850. 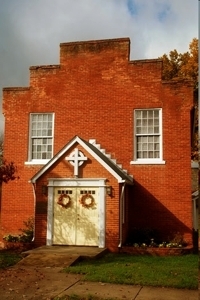 It is one of the oldest churches in Poolesville. The chancel and vestibule were added in 1890 to replace an earlier robing room. In 2008 a large addition was constructed with a new parish hall, choir practice space, library, Children’s chapel, and kitchen. The parish is part of the Episcopal Diocese of Washington which includes the District of Columbia and Montgomery, Prince George's, Charles and St. Mary's counties. 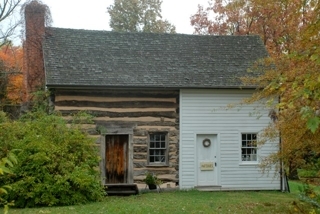 It is thought that the earliest part of this house was built of logs about 1800. Later extended at various times, it is now a pleasant rambling village house occupying an attractive setting. The west end chimney stack is positioned forward of its tapered weathering, rather than back from the gable as would normally be the case. This small dwelling suggests an early nineteenth century date of construction. Its good proportions and diminutive size contribute to the charm of the streetscape. Built in 1847-48, this severe brick building has experienced only one obvious alteration, the addition of the entrance vestibule. During the Civil War, Captain White’s cavalry surrounded the building during Sunday service to capture the emerging Union troops. The group of houses lining the east side of Elgin road are particularly interesting for their attractive situations and the diversity of late-nineteenth and early-twentieth century architectural styles represented. This group of white painted brick houses represents the urban aspiration of early Poolesville. Housing three individual dwellings under a common roof, it was built about 1830 near the site of the Poole brothers’ 1807 store. In 1855 the lot this building occupies contained, besides the present structure, a tailor’s shop, a brick meat house, a log kitchen, a small frame cobbler’s shop and a log stable. Thought to have been built in the 1940’s, this small, simple, ell-shaped house is a good example of late-Federal town house architecture. No additions or alterations of any substance have been made to the house since it was first built. 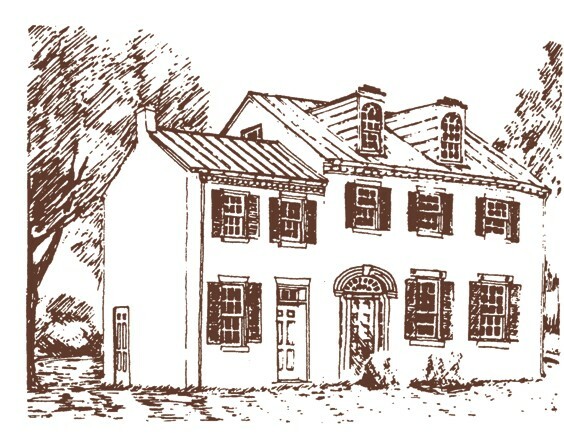 The four houses on Beall Street are situated on lots subdivided in 1806 by Joseph Poole for his sons on what was then Coxen’s Road, then considered to be Poolesville’s main street. The first house you come to was built in the late 19th century and renovated in 1970. House #19713 was built in two sections: the original, story-and-a-half brick section was built before 1828, in a style reminiscent of Tidewater Maryland architecture; the two-story frame wing was added in 1930. House #19707 was pulled to this site by two steam tractors in 1912 from another site on Coxen’s road. Its main section was probably built in 1860. Construction of the new Town Hall was completed in September 2008. It has public meeting rooms and offices for the town commissioners, town manager and other professional support personnel. To see the old hand drawn Trail Guide site maps for The Poolesville Town Walking Trail (now out of date), please go here.